What’s One More Project . . . or Two, or Even Three? Ryan and my brother in law, Aaron, finished the homework the contractor gave them. 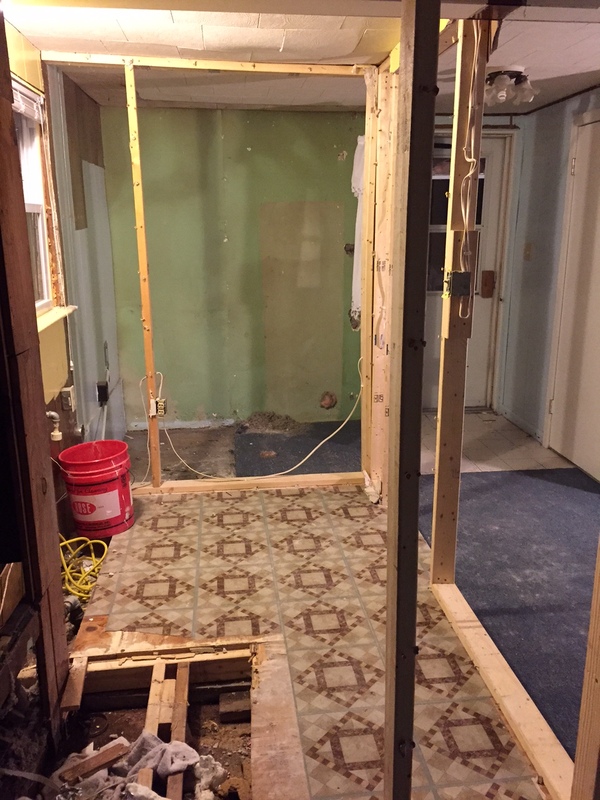 Which was removing the floor, 2 last kitchen walls to the studs, and open up the half bathroom wall to expose the main plumbing. 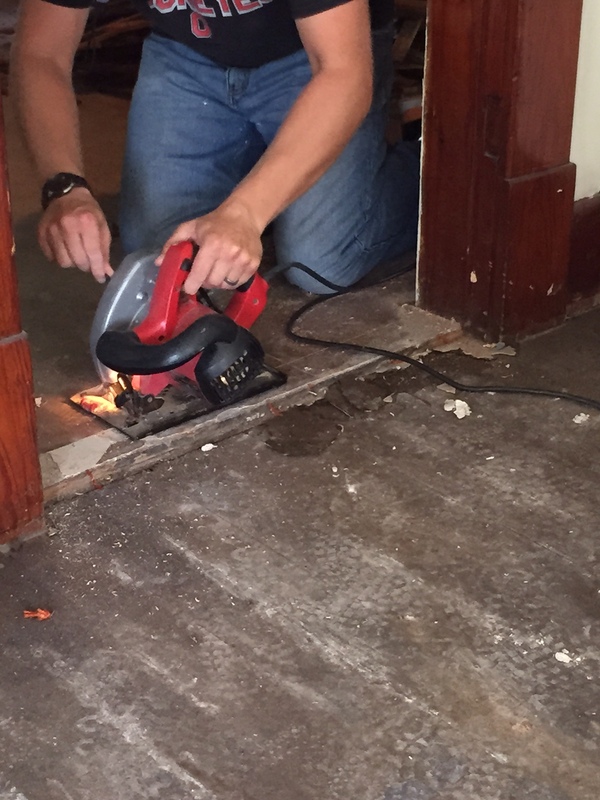 Ryan tested a spot to make sure he wasn’t cutting too deep, and he got it right the first time! Once the test spot was a success, it was on to cutting bigger pieces. 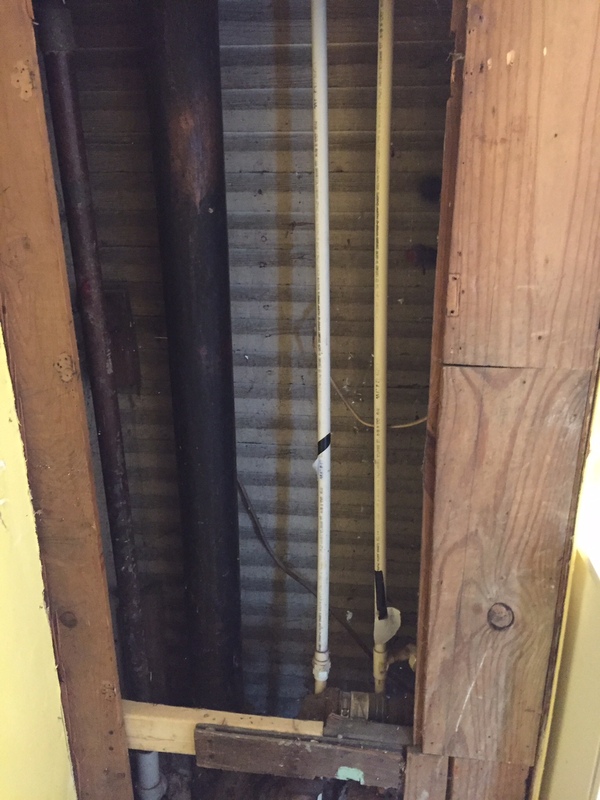 Next it was on to exposing the plumbing in the half bath, so the plumber could start working. Old cast iron sewer pipe exposed, and other plastic pluming lines. Plumbers started on Monday!! 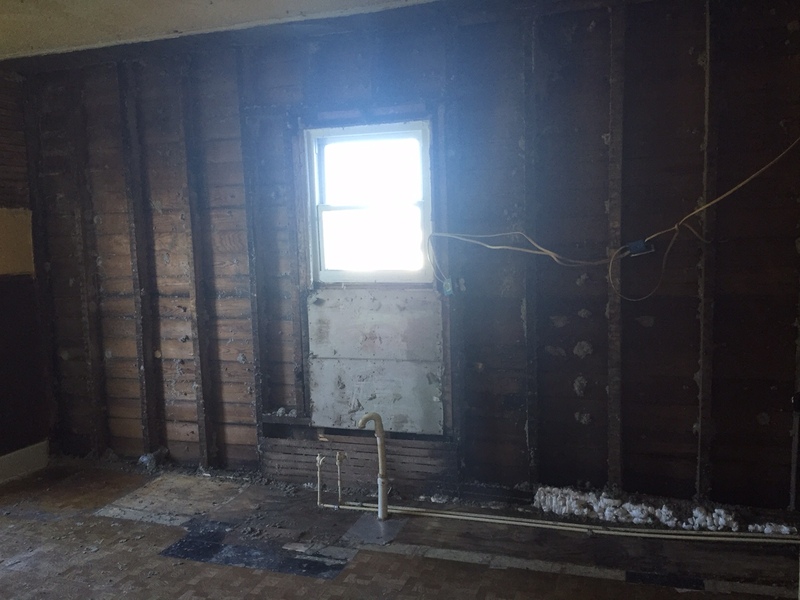 They started to remove all the old cast iron, galvanized plumbing, and old flimsy plastic plumbing. We did have a little bit of news on Monday, when they started to cut and open things up. The main water pipe was running a different direction then what they had thought. The direction it is running, goes completely under the house, and if there was a future issue with it, we would be tearing up our new kitchen. So, we decided that it was a good idea to replace the pipe up to the point of it being outside. Our main plumber, Mike. Thankfully, he has said this isn’t the worst he has seen. However, when I said we have a major plumbing issue, he said, “Amen, to that”. We decided since we were putting down a new floor in the kitchen, we should just extend the flooring into the family room. 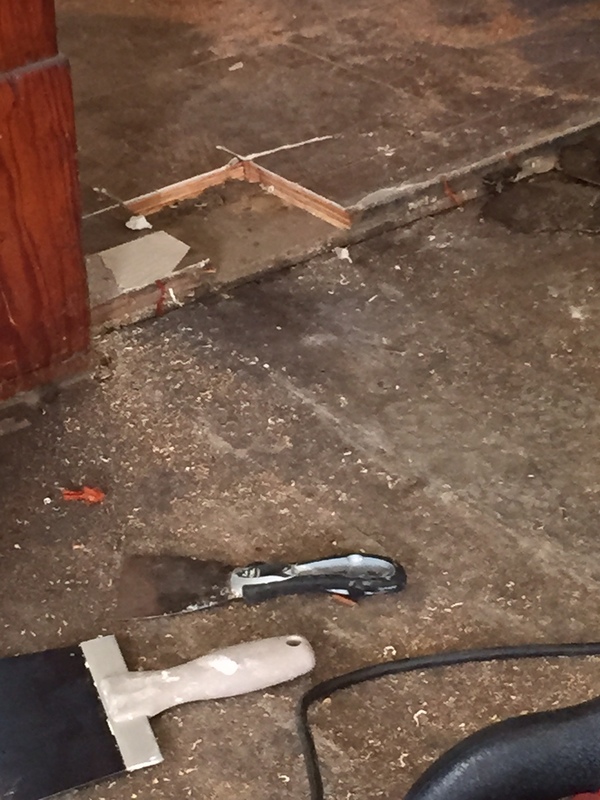 I was 99% sure the hardwood under the carpet was damaged, since I had pulled up a corner when we first moved in, and it didn’t look that great. So, the boys pulled out that carpet this past weekend too. 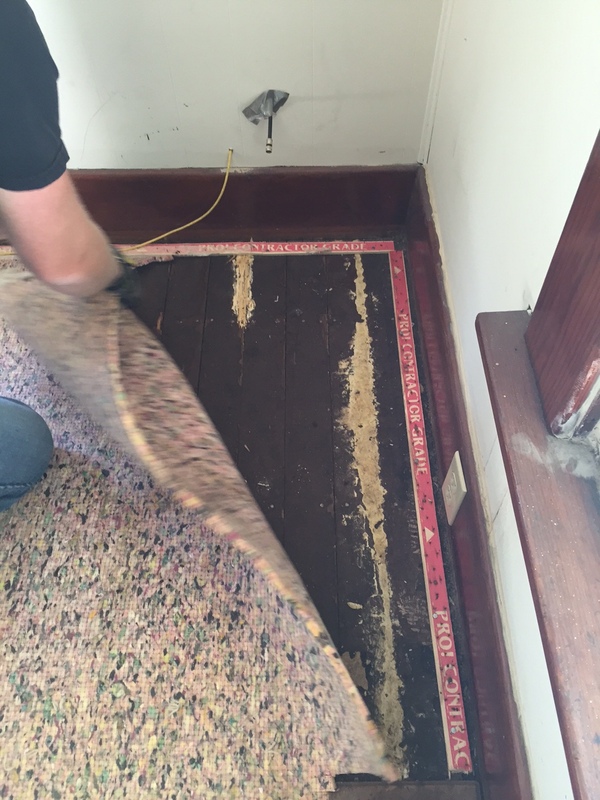 Every time we pull back carpet, it’s exciting. We never know what we will find. I was right, bad patch jobs. More old vinyl, like we had upstairs. 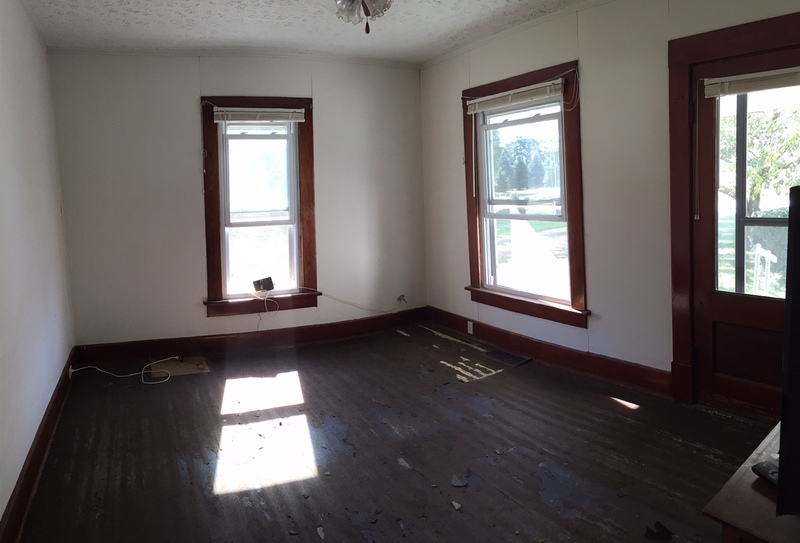 Blank slate, ready to be painted and new flooring put down. 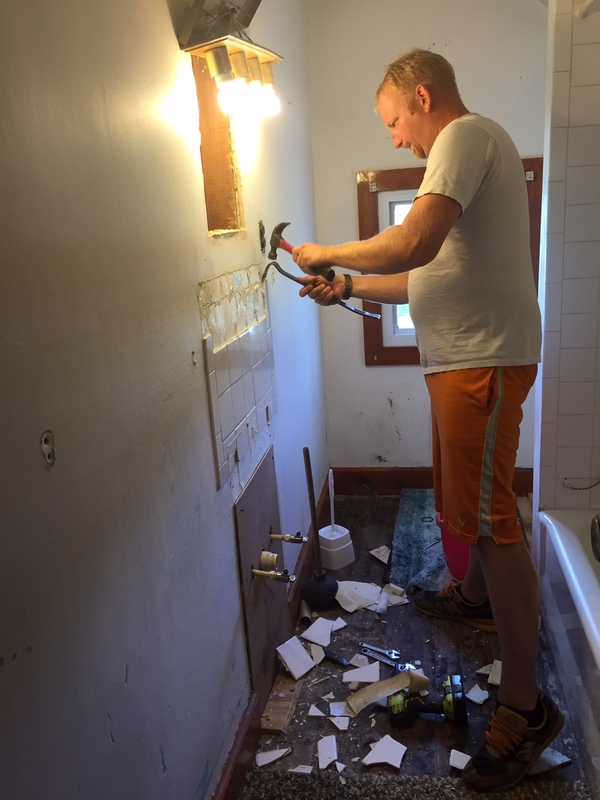 After talking with the contractor, we decided that we should just go ahead and plumb for the shower, since all the plumbing is exposed and 100% of it will be brand new. 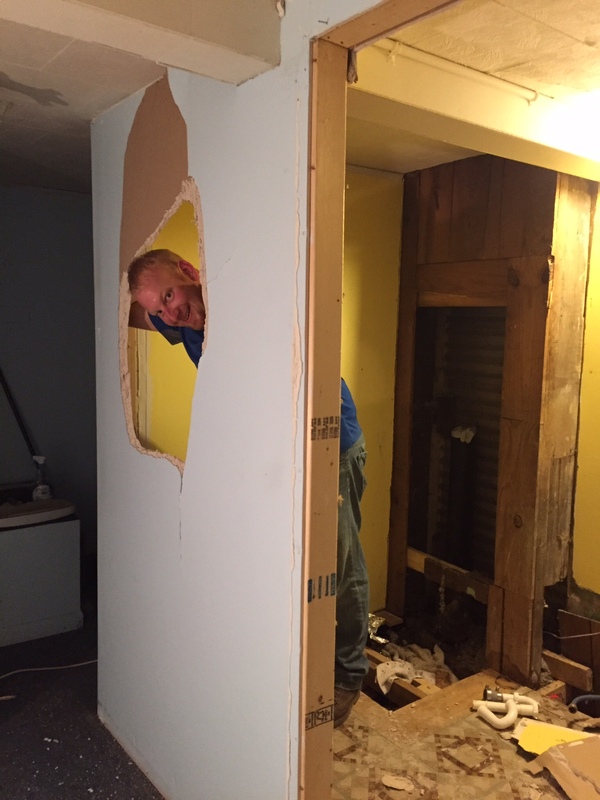 Since we were going to be plumbing for a shower, and new plumbing for the toilet and sink were already going to be re-ran, we decided to move the location of the bathroom. This will improve the flow, and we wont have a narrow path to the rest of the house. 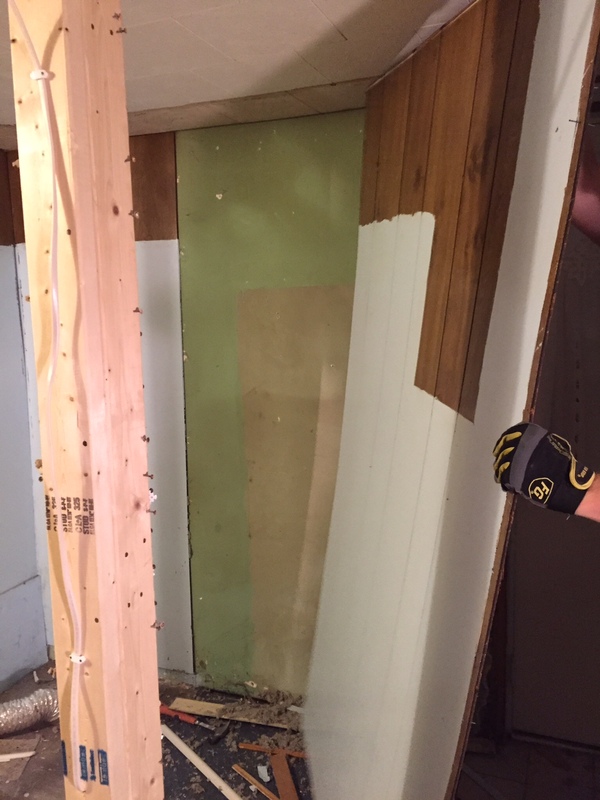 The last picture, is Ryan removing the wood paneling and exposing the old plaster, painted a fantastic green! Here is the space when we first moved in. 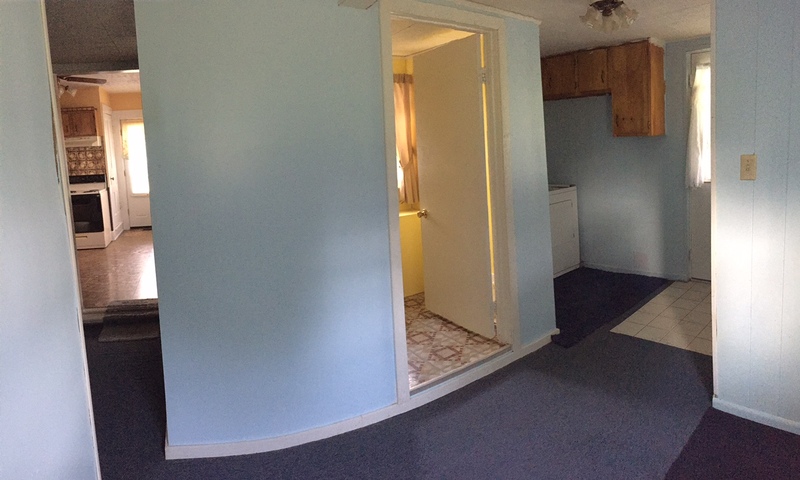 We are moving the bathroom down to the right, where the washer/dryer are. The washer/dryer area will be placed where the bathroom originally was located. Here we have it to the frame. We will be taking the rest down this weekend. Now, we don’t have enough going on, so we decided we needed to take the rest of our free time and start cleaning up the land, and repairing fences. 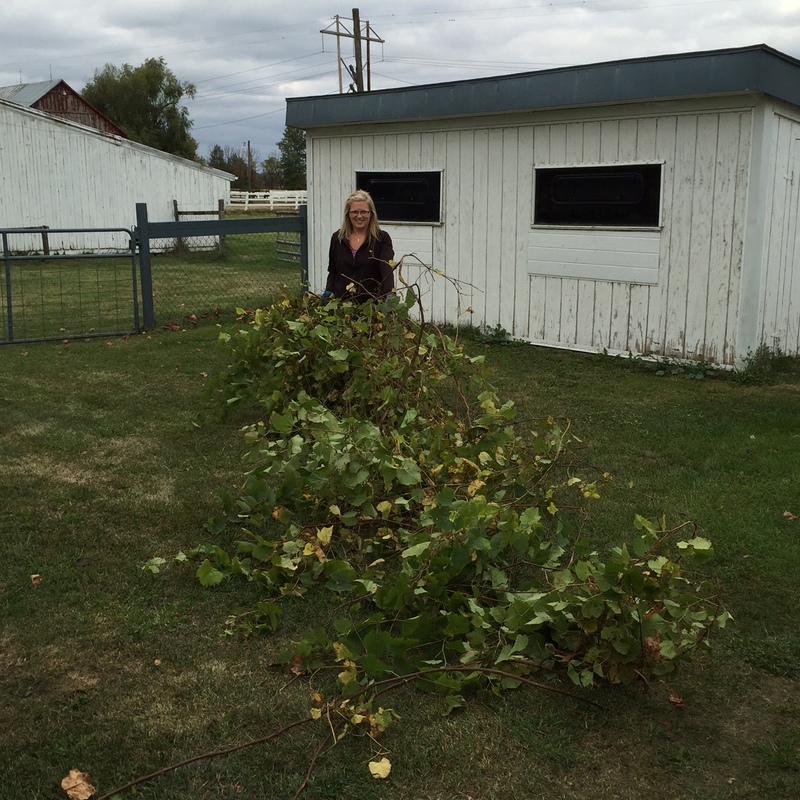 We took 2 hours, Tuesday afternoon, and started to cut vines, pull down old falling down fences, and clean up the chicken coop area. 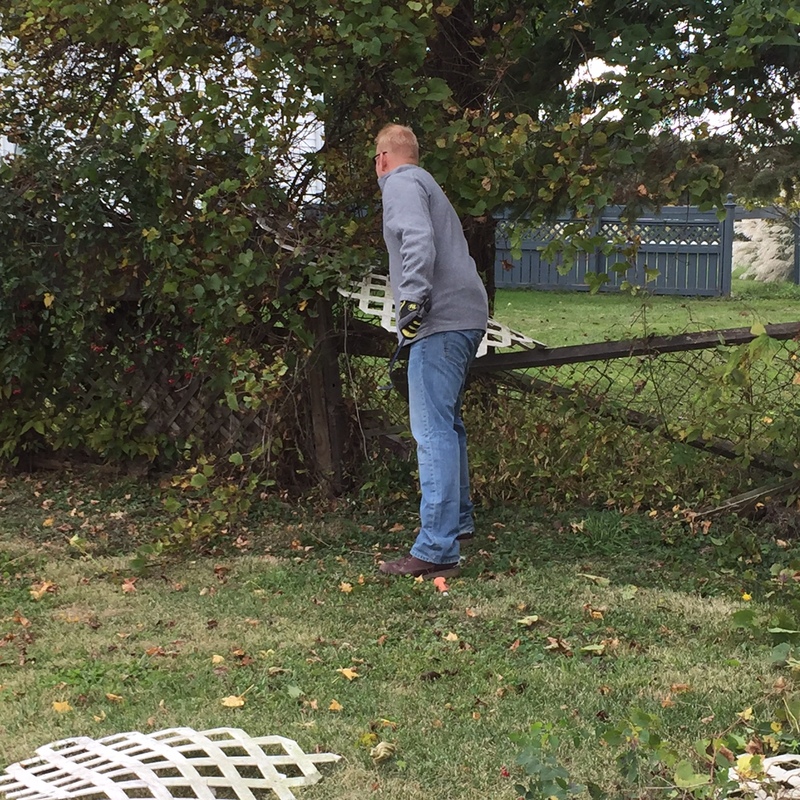 The fence, is actually 3 different mismatched, falling down fences. The entire space is overgrown by vines. 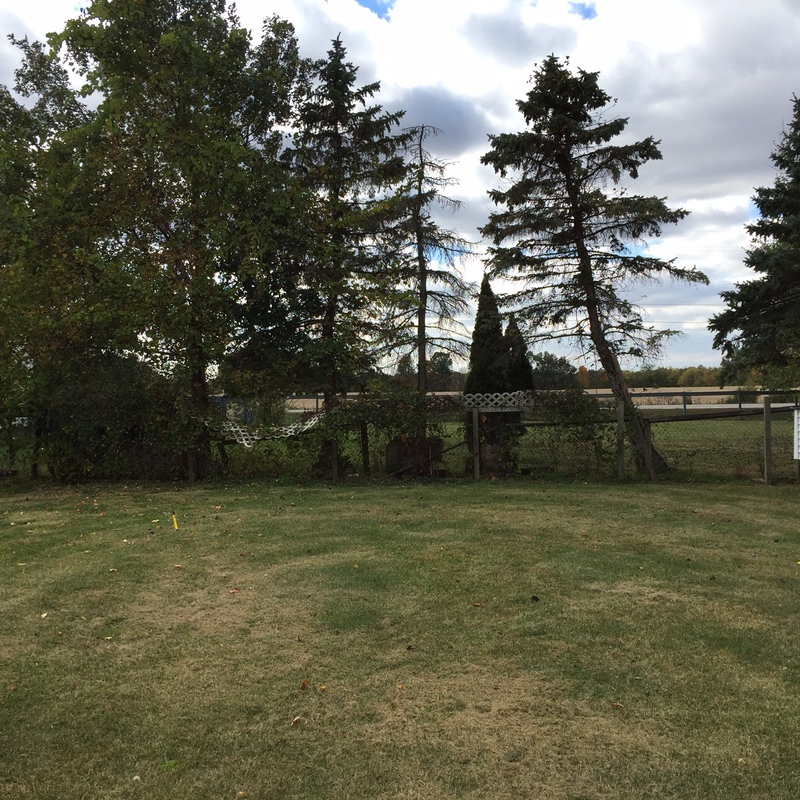 The fence posts are actually good, and we have a bunch of chain fence to replace what is currently here. 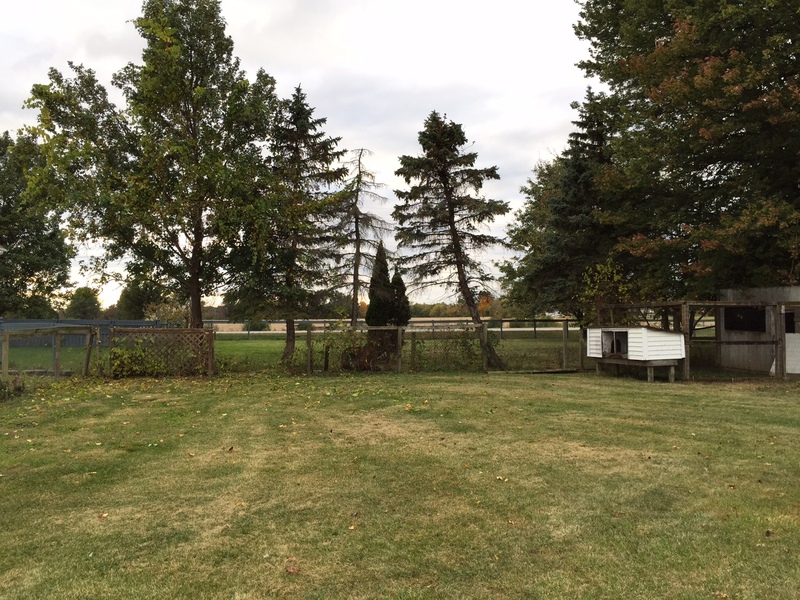 This is our chicken coop area. It’s a little overgrown, and needs a lot of love. Here is the area, with 95% of the vines down. There are still some high up in the tree, and we need to get the ladder to get them out. 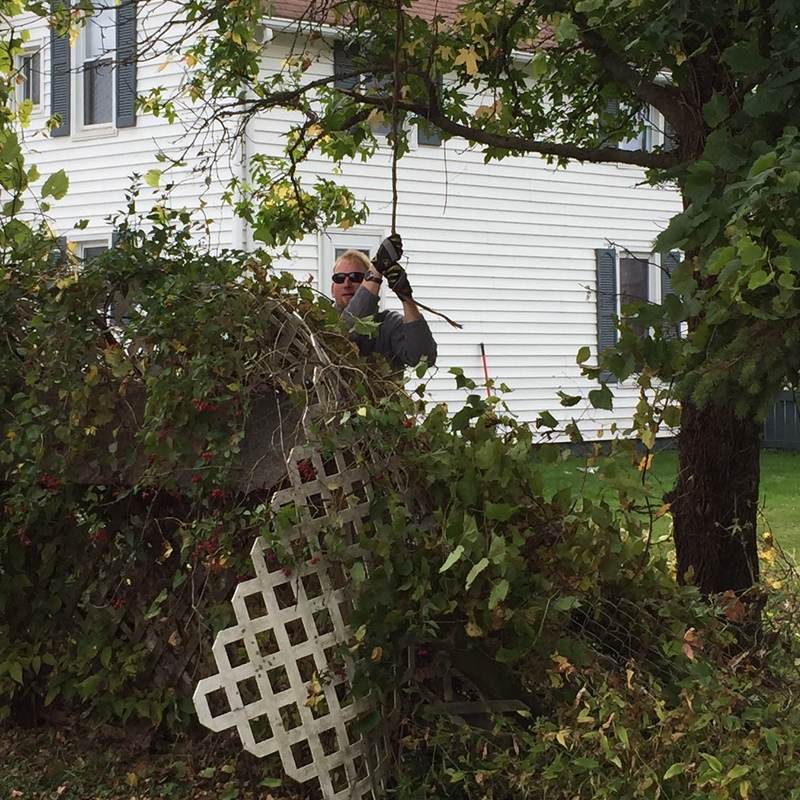 We need to get a few different tools, to get the rest of the fences down. However, it is looking much better already. 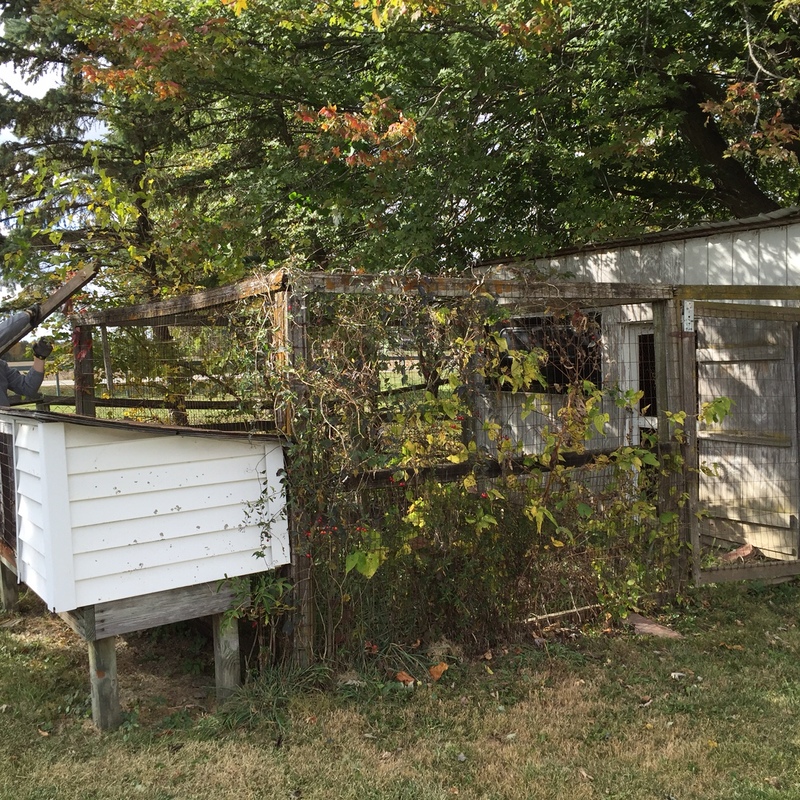 The chicken coop needs new wood to outline it, as most of this wood is rotted. 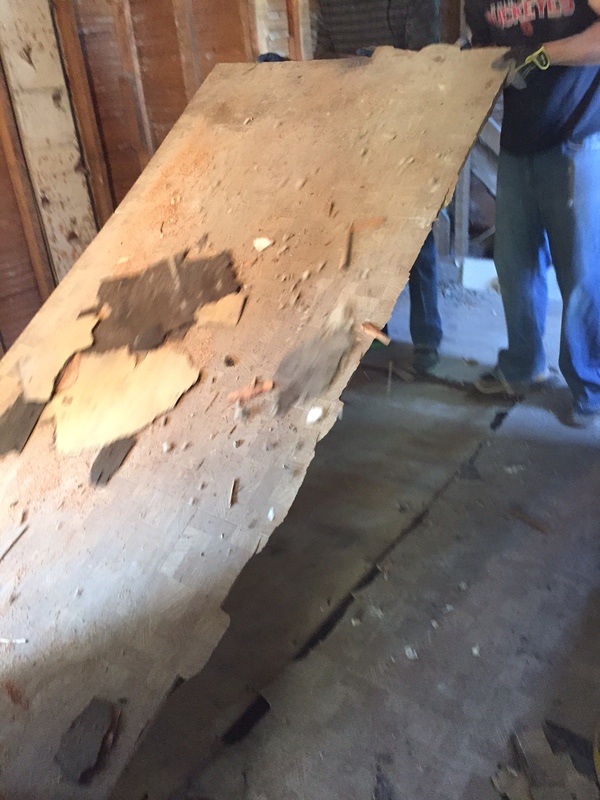 Good thing we have a ton of wood in the barn, and thankfully it is not rotted! Our Sunday started off as we had planned. We got Aubrey’s fan hung, I cleaned her windows, and even managed to put 2 coats of paint on her closet. 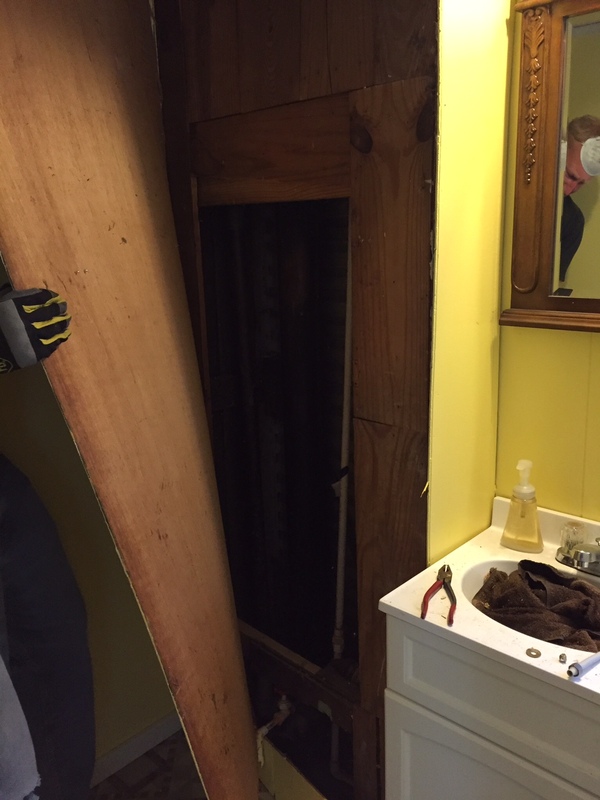 We had moved to the bathroom to take out the sink, take the back splash off the wall, remove the baseboards and figure out the toilet situation. Everything was moving along, and then we got to the toilet area. 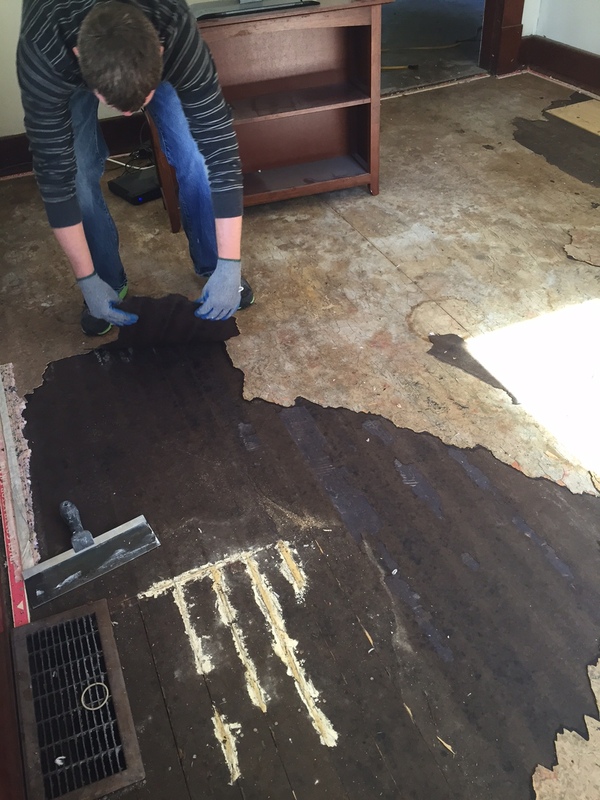 Ryan started to pull up the thick sub floor, and that’s where it all started. The pipe broke, and water was gushing like a geyser. I have never seen so much water in such a short period of time. A few minutes, felt like an hour until we could manage to get the main water turned off. Where we thought the main water valve was, it was not. Every valve we turned, did nothing!! So, we scrambled around the house looking for it. My mother in law told me to call the previous owner, and lucky for us I knew where his number was. Thankfully he answered, and told us where it was. The water had run for 7 minutes, and those 7 minutes had done a ton of damage. 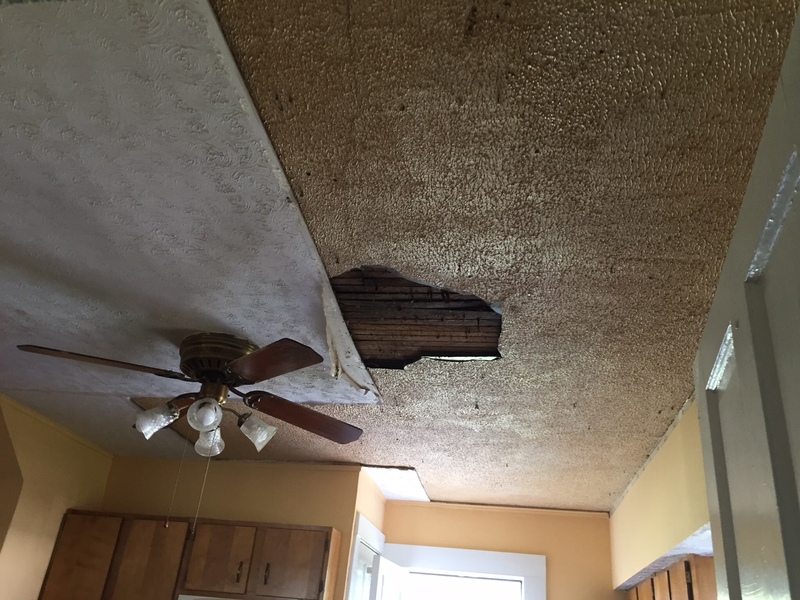 The bathroom is right above the kitchen, and the water had no place to go, but down. 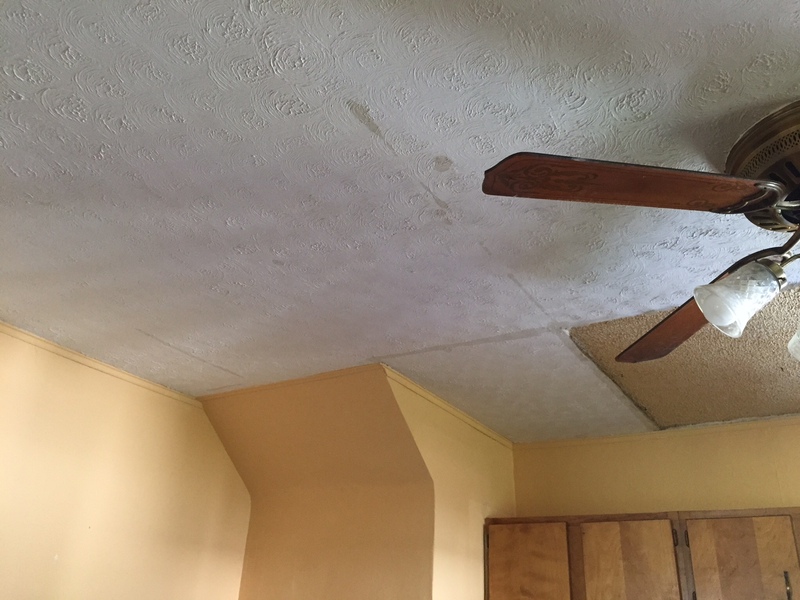 Our ceilings started to fall in large sheets, Water started to pour through light fixtures, and down the walls, through the cabinets and built up in the ceilings. 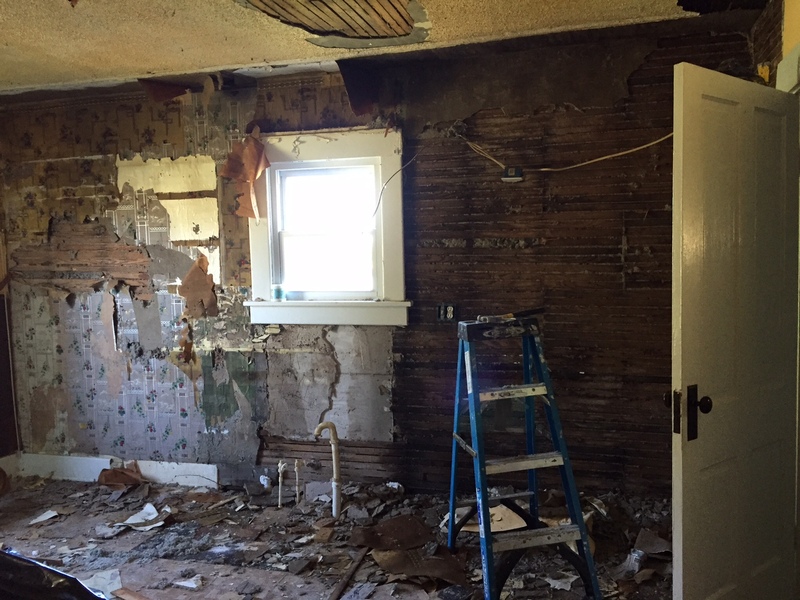 Our ceilings started to fall in large sheets, and even took some of the plaster off, which exposed the old lath boards. In once section of the kitchen, you can look up and see into the bathroom. Once we got the water turned off it was time to assess the damage, and start the clean up process. 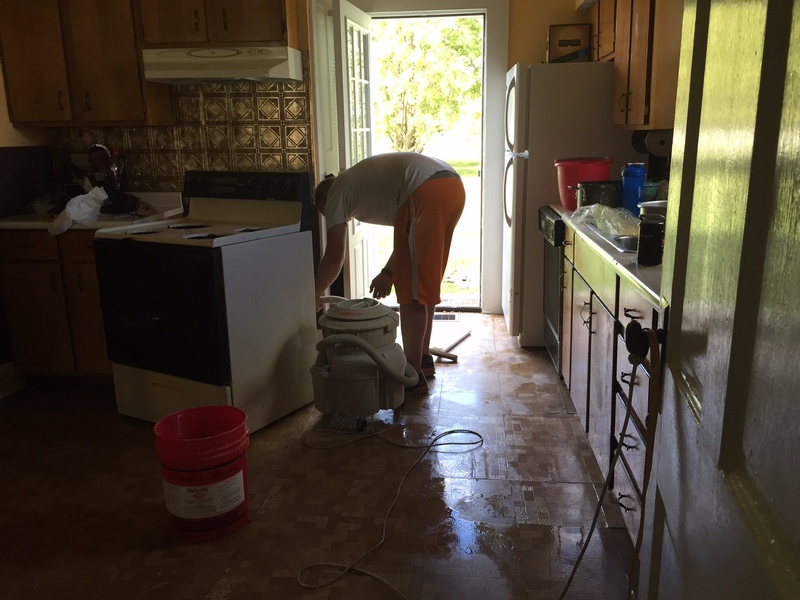 Ryan and his mom worked on the clean up, using a shop vac to get the inch of water out of our kitchen. I have never been so happy to have an uneven floor, because all the water went to one area of the kitchen and kept it from running into the family room and kids playroom. While they were cleaning, I was on the phone with the insurance company. The insurance company said our claim was serious enough to issue an emergency maintenance service, to help with the clean up process. Ryan cleaning up the water behind the oven. Our poor old oven, took a bath. Don’t think we will be using this again. The dark spot is where the drywall and plaster came off. When standing under this spot, and looking up, you can see up into the bathroom. I don’t think this is normal. 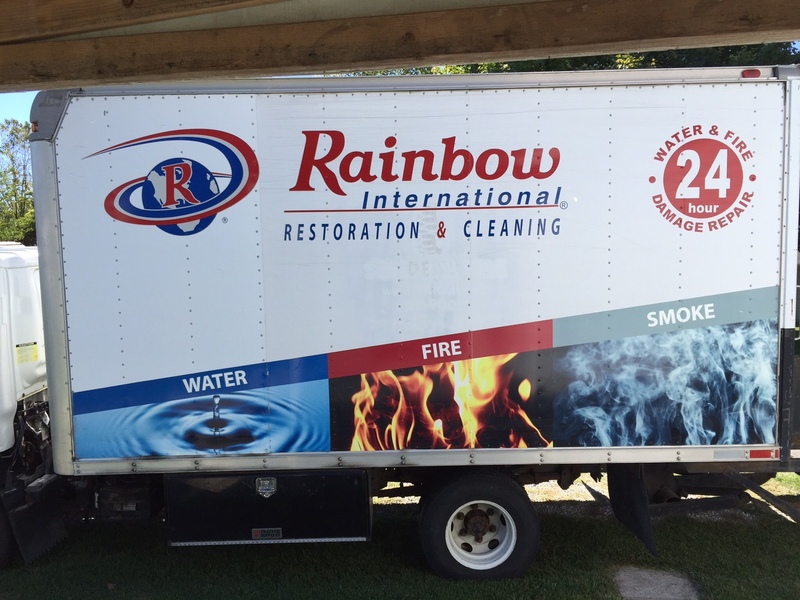 The emergency maintenance service arrived, and started to evaluate how wet the ceiling, walls, cabinets, and floors were. Great company. Friendly, and fast and did a great job. 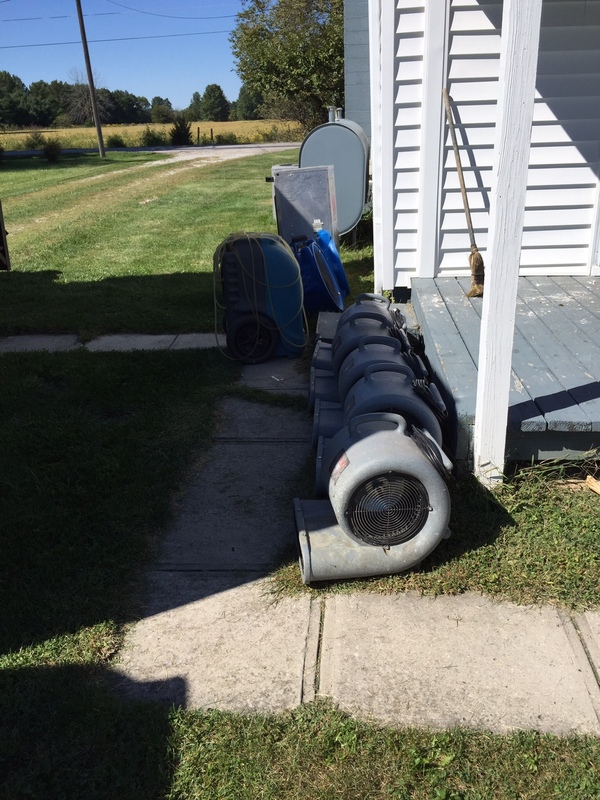 Big fans to start the dry out process. The conclusion was, about 80% of our kitchen is wet. 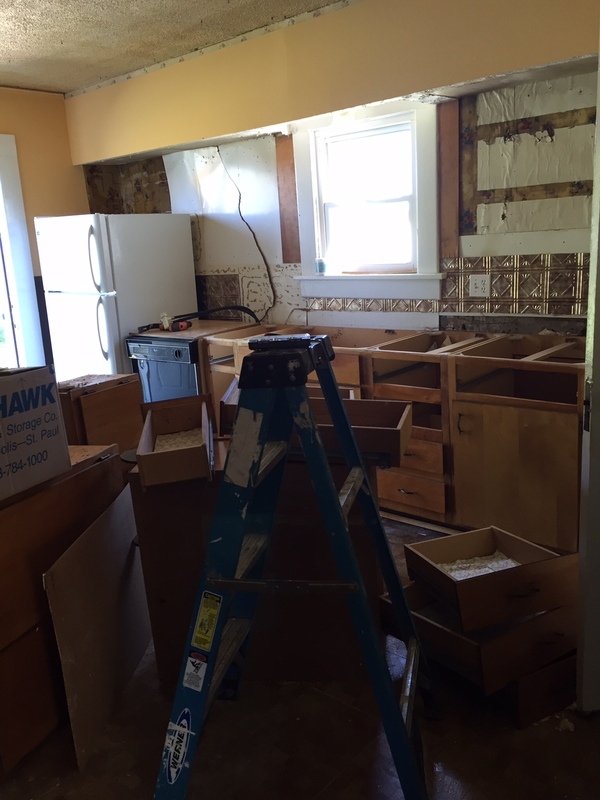 They spent the day gutting our kitchen. 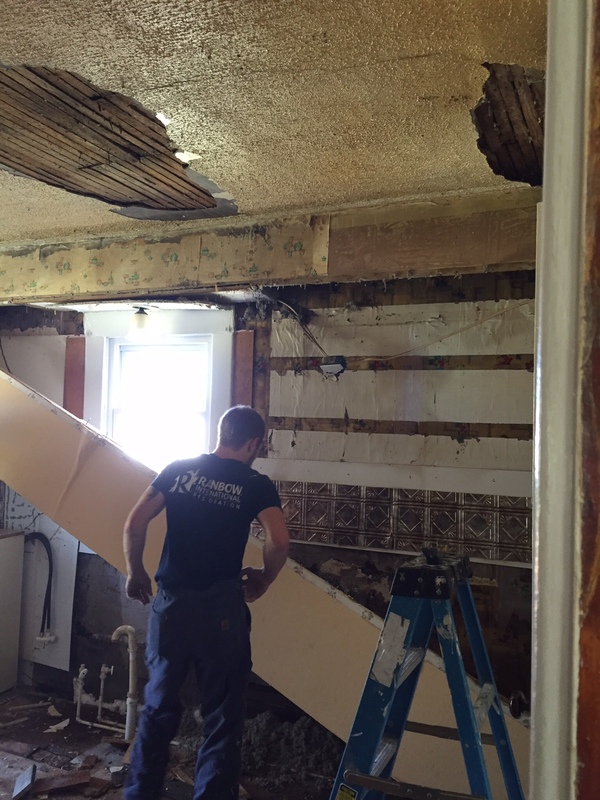 They took out all the cabinets, and walls down to the studs, and removed all the drywall from the ceiling and peeled the wet plaster that was loose. 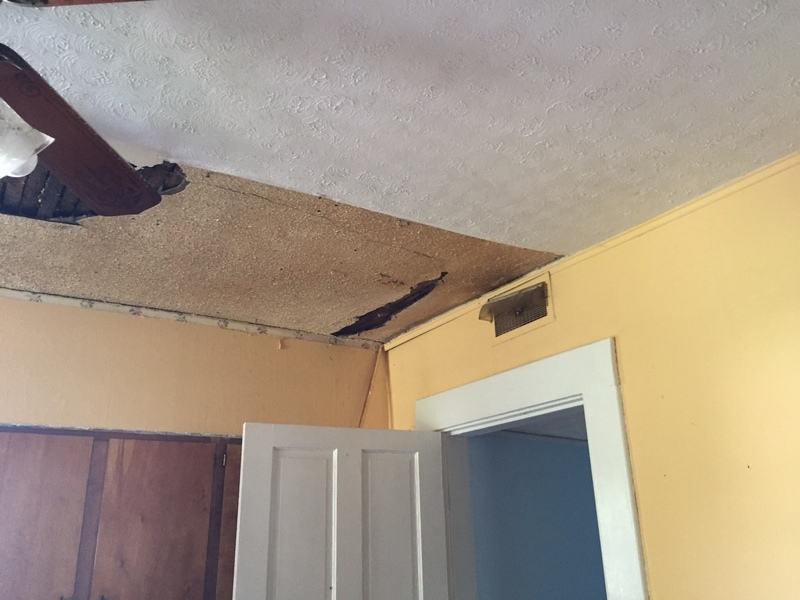 Next step in this process is the claims adjuster coming out on Friday, once the area is dry, to do his estimate of cost of damage. 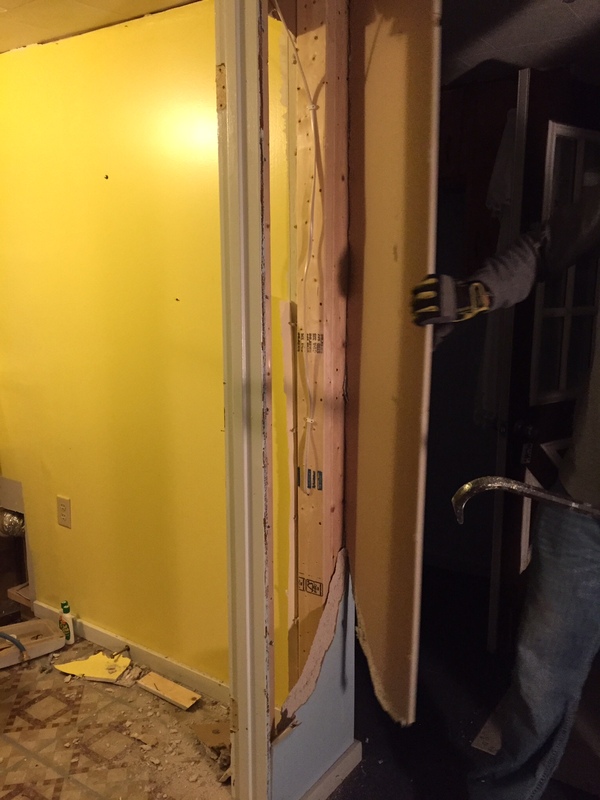 Then the work begins on getting our new kitchen and upstairs bathroom figured out. Thankfully my parents, who live down the road are letting us live with them. 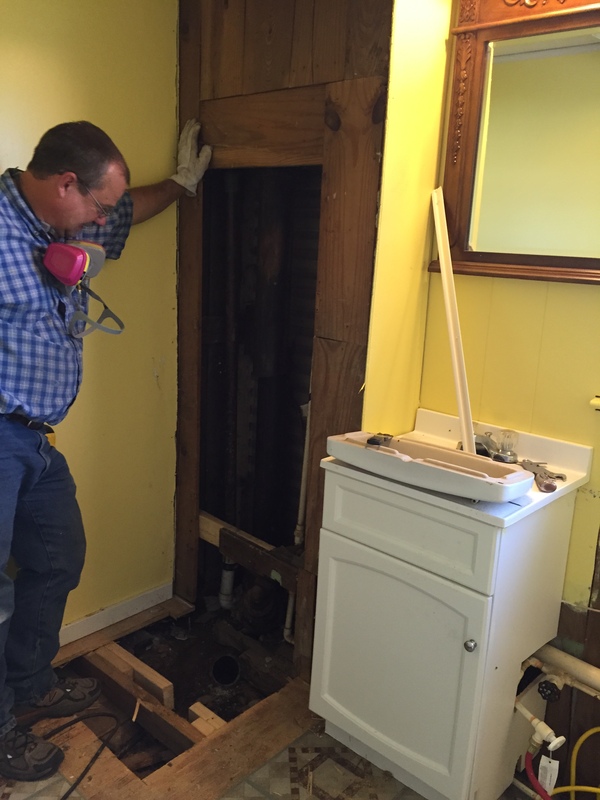 We can’t move back in, until we get the bathroom water line fixed, and the water back on. Lots more to come . . . . Welcome to Life of a New Farm Girl! My name is Sarah, and I'm a city girl who has gone country. 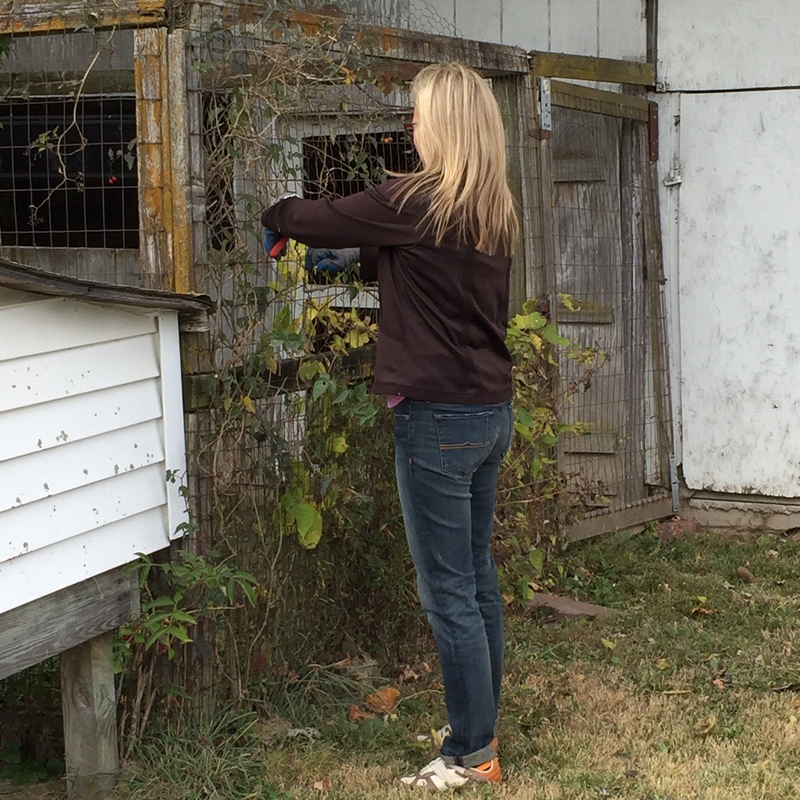 Follow my journey as I learn about chickens, turkeys, quails and renovate my 120+ year old farm house. It's been an adventure already, and I don't see it slowing down. Thanks for stopping by! This outbuilding has been an eyesore since we bought the farm. When we purchased the property the old owner had 15ish cats living in this building, so for 3 years we have called it the Cat House. I’m so excited that the Cat House is DOWN! !